Strawberries are luscious fruits that is loved by all, especially by kids who love its juicy flavor. This luscious fruit when becomes a main ingredient of a cake, its tastes even better. It is simply awesome. This cake not only tastes good but also looks lovely too. The mere sight if this cake and is tempting and every one will love it especially kids who have always wanted the strawberry flavor in their deserts. Content: 1/2 kg strawberry cake. You can also set cake weight as per your wish. The strawberry cake with candles makes up for an amazing cake which is perfect for birthday celebrations and other special occasion.It is often seen that people buy cakes but forget to buy candles and this can ruin the moment of celebration. 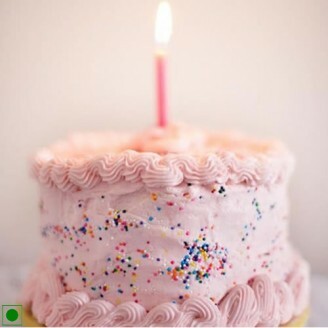 But with this strawberry cake, you can easily get candle so that you have joyful and interrupted celebration. Get this beautiful cake and enjoy it- the creamy texture and the goodness of strawberries. .
You can present this cake to your best friends on special occasions like farewell freshers party, birthday parties.